While my couch and I were re-connecting during that lovely, lazy week before the new year began, one of the books I read was Nigella Christmas . This was my first experience with a Nigella book. So, the references made to her previous books regarding recipes and friends were lost on me. It is, however, full of festive ideas for entertaining during the holiday season, and I was instantly inspired to try a couple of things. She presents ideas that don't require too much preparation time for casual gatherings. 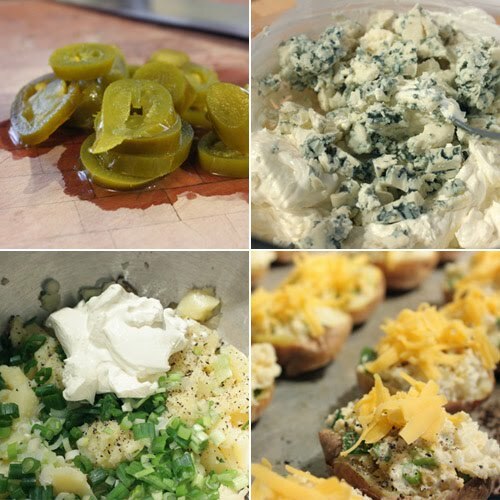 For our New Year’s Eve night of fun food, I wanted to try the double blue crostini and the fully loaded potato skins. Nigella explains that she makes simple canapes with tortilla chips rather than toasted pieces of bread because it's a time saver and good, thick tortilla chips 'resist sogginess longer.' The double blue crostini were blue corn tortilla chips with a blue cheese dip, and the fully loaded potato skins involved yet another bacon situation which I’ll explain. For the blue cheese dip, room temperature cream cheese and sour cream were stirred together, and then blue cheese was mashed into the mixture. 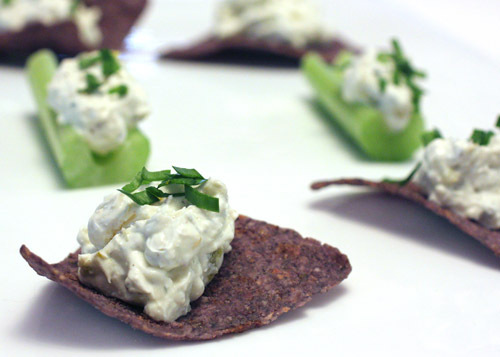 Finely chopped, pickled jalapenos were added, and the finished dip was scooped onto blue chips. Celery is always good with blue cheese, even though it went against the double blue concept, so I used some as a chip alternative. Now, the point of the potato skins was that the filling mixture plus bacon on top made them fully loaded, so I couldn't skip that topping. I could have gone the route of using turkey bacon, but instead I decided to get creative, make a change, and use hot smoked chipotle salmon. I opted for mini yukon gold potatoes, and they were baked, halved, and hollowed. The potato pulp was combined with sour cream, chopped scallions, shredded cheddar cheese, and a bit of Worcestershire sauce. More shredded cheddar was applied on top, and they went back into the oven until melty and warm. Just before serving, I added pieces of smoked salmon to each. I completely understand if you choose to fully load your potato skins with proper bacon, but the chipotle smoked salmon was a delicious alternative. As for the filling, there’s no denying the lure of potatoes with sour cream and cheddar. 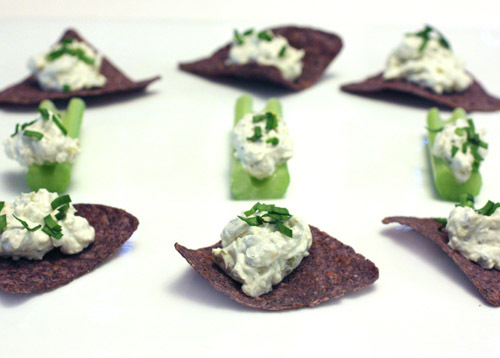 Regarding the double blue hors d’oeuvre, this was a simple but genius combination. The pickled jalapenos added addictive acidity and spice. Don’t start eating these while you’re hungry like I did because they’ll be gone far too quickly. This book offers Christmas-specific recipes and some to use all year, but I especially look forward to pulling it off the shelf when the holidays arrive again. I see some Super Superbowl snacks here! I am all about the apps! The Double Blue look like a great Super Bowl snack for sure! I have half a jar of candied jalapenos left from a cheese ball I made over Christmas. I wonder if these would be a decent substitute for the pickled jalapenos? OMG! Now I want to have a party so I can serve these lovely tidbits! Or maybe I'll just eat myself into oblivion. Maybe I can have just a party of one. I think that sounds about right. 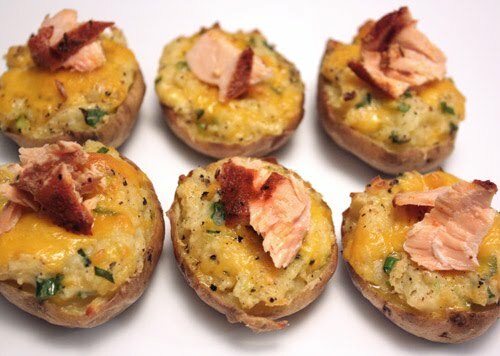 I would throw caution to the wind and add the bacon to those tasty little potato treats. Oh my, this looks like the perfect party food - were you and your couch rocking out? =) Holy cow, I mean pig, I mean fish - these rock! How delicious is that look Lisa! Perfect finger party food. Both sound delicious and perfect party food. Fancy, fancy bites. The salmon on the potato is genius though. Oh! I am so bookmarking this one. Those double blues looks fantastic! I adore potato skins. I love the use of salmon, I've never seen that before. It is positively inspired. Have a wonderful weekend daaaaaahling. both the skins and the double blues look fantastic! love the salmon as a replacement for the bacon! totally agree about super bowl. just sent this post to my sporty sister in law. These both sound like such special little treats for snacking on! 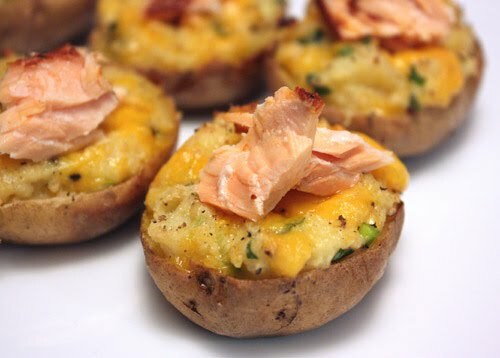 The chipotle smoked salmon sound delicious all on its own - I love that you used it for the potato skins! there's a dearth of blue foods in this world, so i'm excited to see two of them together! and of course, who can pass up some loaded tater skins? not this girl! These have to be the prettiest little finger foods I've seen in a while. These look delicious. I feel like I need to have a party so I can serve them up! Nice work. I love both cute little apps! I'm actually craving French fries right and one of your loaded potatoes would be even better - yum! Scrumptious bites, so perfect for the upcoming super bowl parties! I think my son will love the loaded skins with salmon, as it was the first thing he mentioned he wanted to eat when we arrived!